We help make branding, office and home organising activities professional and easy. Using our FREE online design tool, you can create customised labels, stickers, business cards and more. 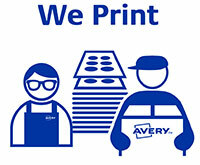 Print from your very own printer or have Avery WePrint, print it for you. Create your own customised Name Badges to meet and greet new people for each event you attend. Save time and ink with labels engineered for a more reliable feed through your printer. 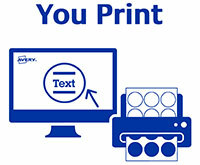 It’s a free and easy way to design, edit and print Avery labels, cards and more. Our free Design & Print template software helps you customise your Avery products so you can print what you need, when you need it from your printer. Create customised products using our online design tool and WePrint it for you. We offer premium quality branding products at low minimum order quantities, delivered to you in 2-5 business days!